MIKE MAROTTA: Hi, this is Mike Marotta, and I’m an independent AT consultant with Inclusive Technology Solutions, and this is your Assistive Technology Update. JOSH ANDERSON: Hello and welcome to your Assistive Technology Update, a weekly dose of information that keeps you up-to-date on the latest developments in the field of technology designed to assist individuals with disabilities and special needs. I’m your host, Josh Anderson, with the INDATA Project at Easter Seals Crossroads in beautiful Indianapolis, Indiana. 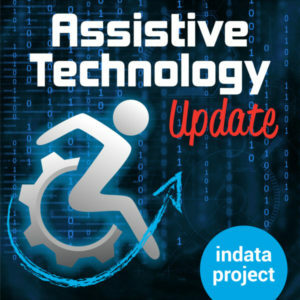 Welcome to episode 389 of Assistive Technology Update. It’s scheduled to be released on November 9, 2018. On the show today, I’m super excited to welcome Mike Marotta on to talk about all things AT, what he’s seen, what he knows, and what kind of advice he can give to those of us in the world of AT or just interested in assistive technology. Also, don’t forget, we are just two weeks away from our holiday show, where we talk about all the things that we would love to get for the holidays or give, or the new pieces of technology, assistive and not, that we are very excited about. If you want to be a part of that show, just call our listener line at 317-721-7124. You could leave us a message with perhaps a piece of technology you are I can do about this Christmas or maybe some holiday tradition you have. Leave us a message and we will try to get that played on the show. You can also write us an email at tech@EasterSealsCrossroads.org. Or shoot us a line on Twitter@INDATA Project. We have a lot of fun things lined up for that show, but we would love to have your input, have a little bit of audience participation, and have you be part of our holiday episode as well. So please help us out. On the show today, we are very excited to have Mike Marotta, ATP. He has presented all over the country on various types of assistive technology and accommodations, but he’s been nice enough to take time out of his busy schedule to take time to talk with us today. Mike, welcome to the show. MIKE MAROTTA: Thanks, Josh. I appreciate the offer. I love being here. JOSH ANDERSON: We are looking forward to it. Just to start off, you have a very expensive and rich history in assistive technology. And it somehow you originally got in the field? MIKE MAROTTA: It’s interesting and I love telling the story to people. I do a lot of work now with educators, so I made an out of schools a lot. But what always catches them off guard is when I tell them, by training, I’m actually an engineer. I came into the AT field through engineering. When I finished engineering school, I thought I couldn’t find a job as an engineer. So my mom worked in a center for people with physical disabilities, and they were looking for somebody to fix will chairs. I took that job thinking this was a perfect hold me over for a little bit. 30 years later, here I am in the field of AT. JOSH ANDERSON: Isn’t that amazing how that works out? MIKE MAROTTA: It’s so crazy how that works out. JOSH ANDERSON: It seems like a lot of people I talked to, if they don’t come from education, it’s assistive technology was that stopgap to do while waiting to do something else. MIKE MAROTTA: Exactly. That’s what makes are filled really interesting. Many of us don’t start off this journey in the AT field. We come to it from so many different areas, which makes for excitement when you start talking to other people and looking at different ways that they can approach a solution. They bring their own background knowledge into it from those different fields, which is always exciting when you think about that to solve problems, which is what we do in AT. JOSH ANDERSON: Speaking of solving problems, can you tell us about Inclusive Technology Solutions? MIKE MAROTTA: That’s the name of my consulting company. So I’m an independent AT consultant. I work all around the country, based out of New Jersey. I provide training, professional development, systems change activities for organizations looking to better implement assistive technology, I’m just diving into the tools as well. It’s a lot of professional development locally to where I live. I do work with schools, and I go in and out of organizations. That’s where I get my direct hands-on work with individuals with disabilities. JOSH ANDERSON: I was looking through your website, and I find that you are a Raspberry Pi certified educator. I’ve got to admit, I haven’t seen that before. Can you tell our listeners a little bit about what that means? MIKE MAROTTA: This is exciting. For people who aren’t familiar, Raspberry Pi is a small, single board computer. It’s maybe about $30 for the computer board, and what you do is program it to complete certain tasks. It’s programmable, it teaches students about computer sciences and physical computing because you need to hook that board up to other peripherals in order to complete a task. So the Raspberry Pi Foundation offers this today, what they call the “Pi-cadamy.” This past summer, they did it all around the country, mostly focused towards general educators in STEM programs and things like that. I went and was accepted. You had to apply to it and be accepted. I got accepted with the slant of I want to use these tools to support individuals with disabilities and look at this as an AT solution. After going through the two day training course, I was anointed a certified Raspberry Pi educator. JOSH ANDERSON: How can you see the Raspberry Pi helping people with disabilities? MIKE MAROTTA: It’s interesting. If you think about it, all these electronic tools that are out there now, a lot of them quite expensive. But if they are computer-based and the functions are relatively straightforward, can we take some of these simple computer boards and program it to perform some of those tasks? For example, some of the projects I’ve seen online that other people have done that I think fit nicely into this idea of AT, there was a group that created out of a Raspberry Pi board and some Legos, they created an automatic a book scanner to convert digital print books into electronic versions of those books. So the raspberry pi was the brain that control the taking the picture and soaring it so it could be converted to text so that someone could read it off of the computer screen. Or under the one I saw is a Raspberry Pi board that was connected to vertical blinds in someone’s home and gave them automated blinds. So for someone who can’t open the blinds, now they can control that through a timer through the Raspberry Pi board. You think about the environmental control aspect of it as well. JOSH ANDERSON: For sure. For things that either aren’t offered or are just expensive enough that they are not accessible for folks, that’s a great accommodation. MIKE MAROTTA: And when you think about it, you’re talking about the brain of it as a $30 computer board. To get someone to program it for you, which leads itself into the next area that I’m looking to address with this. I’m going to try to partner with a local school district near my house, and we’re going to work with the students who are in the stem programs to start trading some of these AT solutions. JOSH ANDERSON: Perfect. That teaches them not just the stem school they are trying to learn but also teaches them to help folks, and that you can use the skills to help people which will stick with them for a lifetime. MIKE MAROTTA: Exactly. If you think about it a lot, I go in and out of schools all the time, talking to students. All the stem programs are out there and are pretty well-equipped. But not sometimes making the connection to a real-world solution to what they are building. So this idea of partnering these school stem programs with people with disabilities and AT professionals, gives them that real-world, hey, you could be doing this and it would help this person right here perform this task they’re not able to do. The idea of disability awareness, understanding the power of what it is they’re doing. Quite honestly, we could be training the next generation of AT service providers. JOSH ANDERSON: It would be great if they already had that skills coming in, as someone who works with a lot of AT service providers. JOSH ANDERSON: I know you are a big proponent of UDL’s. Do you have a favor device or service? MIKE MAROTTA: When you think about UDL, it’s become so popular. It starting to become ingrained as you move in and out of schools. I think part of that is because we’ve seen this kind of explosion of technology available in education, whether it is one to one or people bring their own devices. We have an abundance of technology available in our classroom that the idea of looking to UDL to encourage educators to think about how to maximize the power of some of those tools in order to provide options for their students to be successful, thinking about it, looking at things beyond just print materials but recording audio and video, and students creating projects to demonstrate their mastery of a school or some knowledge. I think it’s a really exciting time. I think there is a long way to go, getting that universally out there — pardon the pun. But I think we are on a good path for that. The idea of having people think a little bit differently about how to meet the needs of each individual students, not just students with disabilities but each individual student in their classroom. JOSH ANDERSON: We’ve talked about that a lot on the show, just how a lot of things we think of as assistive technology and accommodations are commonplace today, from dictation to text-to-speech. All these things are available in most of the devices we use every day and are available to those kids in the classroom. MIKE MAROTTA: Exactly. Suddenly that doesn’t have to become an AT solution. It’s just a solution, a writing solution, a reading solution. Now for some of the students, that might still need to be identified as AT so that it ends up in an IEP or 504 plan so that they make sure they are provided those accommodations. But for many students, it might just be a preference of how they prefer to approach an assignment. How many of us — you think about reading. Right now, I have three different modes I could read the same book that is sitting on my desk in front of me. I had the book in print. I have it on my iPad. And I have the audiobook of it. I could use any of those. I could read it from the book, but maybe depending on the day, how I’m feeling, what I prefer, or the environment I’m in, I might choose one of those others. So the important piece of having options is so critical. JOSH ANDERSON: What is a great piece of advice that you could give to other AT professionals? MIKE MAROTTA: When I think about advice — and I think about this a lot. I’ve moved to this point in my career where I become — not old, because I won’t say that yet. I’m a seasoned professional. When I think about this idea of technology moving faster and faster every day. Think about it. Something probably came out in the time we’ve been speaking right now. MIKE MAROTTA: Something else is out there that is new. When you can’t know everything. If you tried to do that, you would paralyze yourself. You would not be able to move forward. What I always say to professionals when I talk to them, is this idea of build your network. What does your professional learning network look like? That is the most important thing, not knowing 10 different versions of an app that gives us text-to-speech. Not that. You can go to Google and find that. But building your network to a point where you know the people who know the things you don’t know. And this idea of finding your tribe. I know myself, we were talking before we started about the idea of your coworkers will come past and you will have the conversations. I’m a single person entity. I have no other people to bounce things off of. When I’m sitting at home and I’m working on some AT solutions, I’m staring at myself. I have nobody to bounce that off. But what I do have is a powerful network that I can call on to help me work through some things. Whether it’s using listserv — one of the big things for AT people is the quiet listserv. That’s a pretty traditional email listserv, but it has over 3000 people on it. Put a question out there. You would be surprised at the depth of responses you might get back within the hour. At least pointing you in a direction you might be able to go. Think about connecting on social media. One of the big things I’m a proponent of, I love twitter. It just works for me. I like the small, bite-size pieces of information I can digest and move forward in my day. Find your group on twitter. Every Wednesday night — get ready, Josh, here comes the plug. Every Wednesday night, at 8 PM Eastern, myself and Karen Janowski host the AT chat. Every week for an hour on a Wednesday night, we have an opportunity to talk to a group of AT people from around the country. We can talk in real-time, ask questions, get answers, get resources, connect with each other. I have people that I’ve never met in person but I speak to on AT chat all the time. I would consider these people friends, even though I never met them, because we’ve had deep conversations. We’ve had conversations off-line about things, either through the phone or email or direct messages, that we’ve gone deeper into this idea of helping each other to be better at what we do. What I think about AT professionals, find your group, where the group is. Everybody’s group is going to be different, but find your tribe that can help you be better at what you do. JOSH ANDERSON: I think that goes back to what you talked about the beginning about all of us get into this from different areas and bring different areas of expertise. I think it’s very important. JOSH ANDERSON: Now you already did the plug for the twitter. MIKE MAROTTA: I feel good. I checked that off my list. JOSH ANDERSON: And you are also not new to podcasting. Can you tell us about your podcast? MIKE MAROTTA: The plugs just keep coming. JOSH ANDERSON: I need something to cut out if this goes too long. MIKE MAROTTA: Excellent point. I love it. Good plan. I’ve started doing a weekly podcast called Inclusive Technology for All. Find it on all of your podcast channels, however you listen to podcasts. Usually between a five and 10 minute, short blasts of information. Maybe a resource about a tool that is new, maybe a strategy of how to approach looking at inclusive and accessible technology for someone with a disability. It’s kind of broad. I try to cover all the areas. I’m pretty much a generalist. I don’t stay in one area as far as doing AT solutions for people. I work in education, higher Ed, vocational rehab, and the community. So I see people across that lifespan in across the environment that they might be using tech in, so I brought that to the podcast and let the very broad, just getting people some quick hits of ideas, things on my pull from some of my networks I’m a part of, whether it’s the quiet list or from twitter. Every week on the podcast, we do a roundup of the past week’s AT chat, so people who aren’t on twitter — or don’t want to get on Twitter, for whatever reason — give them the opportunity to at least pull some of the information out of that. Really, the info is the key, not be making sure you get on twitter. It doesn’t matter to me. I don’t care where you go. You could be on twitter, Facebook, histogram, whatever works for you. I think that’s the beauty of some of these channels now that we have for information, is you can get the information anywhere. With a podcast, it’s another way for me to get that info out to people. JOSH ANDERSON: Last plug. Do you have any presentations coming up soon? MIKE MAROTTA: I always have presentations coming up. It’s interesting. We are recording this at the beginning of October, middle of October, so now we are in this push for the year. The school year has started so now you get a lot of these things coming up. I will be in a couple of different conferences coming up. At the end of October, I’ll be at the international dyslexia Association conference doing a full day preconference with a couple of other AT professionals on using AT support to support individuals with dyslexia. That’s kind of exciting. I’m looking forward to that. I’m also going to be out near you in November. I’m going to be in Indianapolis at the PATINS access to education conference, which is at the end of November. I’m looking forward to that as well. The big one coming up in January, I will be in Orlando, because nothing says get away from New Jersey in January than Orlando and a conference. I’ll be at the ATIA conference in Orlando where I’ll be doing a two day preconference on how to use Google tools as AT to support people. That will be great. And a bunch of sessions in between throughout the conference as well. JOSH ANDERSON: Hopefully we’ll get to see you there. MIKE MAROTTA: I hope so. JOSH ANDERSON: What are you really excited about in the world of assistive technology? MIKE MAROTTA: Interesting. What I’m excited about — I’m excited about a couple of things. I’m excited about the potential for wearables, the idea of watches and smart technology that individuals can have with them at all times, from notifications, for scheduling, for keeping people on track throughout a day. Those are really exciting tools. I’m also excited about this idea of virtual reality, augmented reality, and these mixed reality tools. I think we are just starting to touch on what these tools can be for people, and I think that fit so nicely in to support that could be AT to move someone forward. The idea of using virtual reality glasses to experience an environment before you get there. I was at a conference the other day, and I was speaking about this idea of the future of knowledge he is now, when you think about it for AT. One of the things I brought up is you think about this idea of, we may have job coaches who are providing support to individuals in a workplace. Maybe these individuals struggle with the idea of the processes in place in order to be successful out in the community, but wouldn’t it be great if we could have that as a training tool that they could watch and experience through virtual reality in the comfort and security of their center where they are or their home, before they go out in the community. I think for us when we think about AT, the idea of virtual reality, that could be very real for the people that we serve. I’m really excited about that. I’m for to exploring that more. JOSH ANDERSON: I am too. The augmentative reality, all these science-fiction things from back in the day that are finally coming to fruition sure they can really help out individuals with disabilities. MIKE MAROTTA: If you think about it, that’s not even on a lot of people’s radar yet as an avenue for the tool to go. Before us, when I see that, that’s the first thing. I’m like, what if I could use that? That this person flashes through my head. I could use it for this person and we could do this. Maybe they would need a job coach to shadow them. Maybe they would be able to independently live alone because they could’ve been provided some support ahead of time in order to be successful. JOSH ANDERSON: That’s probably what the future holds for assistive technology. What does the future hold for you? MIKE MAROTTA: I just had to laugh. I don’t know. Who can tell? They say technology move so fast, you should come up with a five-year plan anymore. You should have a two-year plan. I think a two-year plan. I continue on spreading the word. I think for all of us, you, me, anybody else who does this, our main goal is to spread the word. I’m always amazed — and we talked about it before, the idea of built in accessibility features in the tools we have, your phone, tablet, whatever. I’m always excited when I meet with a group and I can show people that. There is still someone who didn’t know that was there. That’s exciting because that means they will take the information, because it is very real to them. It lives on their phone. They get that. They will turn around and show that to someone else. That ripple effect will continue out. I think education. I think we will be always educating people. We will always be making sure that people see the connections between what technology could be and how it could support someone as an assistive technology tool. JOSH ANDERSON: We have a little bit of time left. Do you have a favorite story about someone you’ve worked with or a piece of technology? Maybe something that with right, something that what’s wrong? MIKE MAROTTA: I think things go wrong a lot. I think that’s a good thing. Things going wrong gives us some insight into how we do this better the next time. I think just what people be successful with their tools. I was in a school yesterday work with some students. This is kind of a something went wrong and then it turned around and went right, which is great. I had worked with the student last year towards the end of the tool, providing him some tools to help him navigate his school assignments. We are looking at text-to-speech for reading, speech to text for writing. I realized that, in talking to him yesterday, I did a poor job of communicating how this could work for him. What I found when I spoke to him yesterday was he went ahead and figured it out over the summer on his own by watching YouTube videos of how these tools could be successful. I have to remind myself all the time, look for some of the support that are out there to make sure that people can move forward in the way they want to move forward. He came back and said, you know, I haven’t been using the thing you should me, but I want to try it because I watched this video of and showed somebody using something on the computer to do this, and I’m not sure if it is the same thing. It was interesting because it wasn’t the same thing, but the idea was the same. Like anything else, it’s the idea of being better at can you getting and watching students be successful. I was speaking with one of my therapist’s friends at the school where we were at. Finding ways to provide information and support for students so that when they are ready, the support is there. We work with students, and they are not always ready. That always want to do that. It’s not the most important thing for them at that point. But providing in of support and structure that, at the moment they become ready, for whatever reason — maybe it’s a student in high school who is about to graduate and suddenly that becomes very real, very fast. I’m going to be out of school soon and I’d better know what I’m doing. Another straight on success story. I was working with a group of transition age young adults. They were 21 to 25. They were in that high end of the transition age. It was about community integration with technology. The whole thrust was using what you have. Every one of the adults walked into this program with a phone. Every one of them had a smart phone. To a person, they only use that phone for social media, taking pictures, chatting with their friends. That was what they did. But showing them the power of that tool as they start to move out and become successful adults in the community, whether it’s being able to use apps like the seeing AI app for Microsoft and just walk through the environment and take pictures of things and have that phone announce what’s happening around them. This became a tool, not just a reading tool. I like to remind people. Some of these tools that provide audio support are not just reading tools. They are life tools. That’s a tool you’re going to use throughout your life to be successful. One of the people in my group take the bus every day and was using the app to take pictures of the schedule so that it would announce when the bus would be coming and what number the bus would be. And just moving through their day, be successful, with nothing more than the smartphone they had and a free app that they could load on it. I would call it a success story. JOSH ANDERSON: That is definitely a success story. If people want to find out more about you, get involved in that Twitter chat, how do they do that? MIKE MAROTTA: Our AT Cchat every Wednesday night, 8 PM Eastern. Just go to twitter and type in hashtag #ATchat and you will connect with us and see us. Check the hashtag throughout the week because we’ve created a community of people who share. So there’s information throughout the week that people are sharing about tools and strategies for how to be successful. If people want to connect with me, my website is www.MMatp.com. If you want to connect with me on twitter it is @MMatp. If you want to email me it is mike@MMatp.com. JOSH ANDERSON: We will put that all in the show notes. Thanks again for coming on the show today and talk with us. MIKE MAROTTA: My pleasure. Thanks for having me.